That morning, I found Maxine and Gambhira already seated in the tea house, when I arrived. Adams would soon follow. Pema Pera: Hi Maxine, and hi Gambhira! Pema Pera: Gambhira, what are your main interests, in SL, and/or in life in general? Pema Pera: any particular form of Buddhism? Pema Pera: I have heard of that, but don’t know much about it — can you say a few words, to give us a flavor? Pema Pera: Nice o meet you here! Pema Pera: Sorry about putting up your blog so quickly the other day . . . I was refering to the blog Rubble Born Thoughts that Adams had put up recently, not realizing that a reference to my blog would result in an automatic signal to me, which then prompted me to make a link from the http://playasbeing.wordpress.com/ blog to her blog. Pema Pera: I’ll have a look at it! Pema Pera: through a type of Vipassana . . . or is that totally different? Pema Pera: do you want to summarize them, Gambhira? Pema Pera: what is the actual form of practice, a kind of meditation? Pema Pera: or also just watch any thought or emotion that arises? I was very pleased that Gambhira had come back, to tell us more about his practice, after the brief first visit, the previous day. I have a deep respect for Theravavada approaches to practice, often very focused, no-nonse, direct. Stargate joined us, and I summarized PaB for Gambhira. Pema Pera: did you get a chance to look at it? And then reflected a bit on what has been happening here. Pema Pera: so there seems to be something to the idea . . . .
Pema Pera: seems to be especially effective. Pema Pera: a truly novel gift of the internet . . . .
Alas, it was time for me to leave, which was the reason I had spend more time than usual on a quick monologue . . .
Pema Pera: and unfortunately, I have to leave in 2 or 3 minutes . . . .
Pema Pera: next time I hope to hear more from both of you! 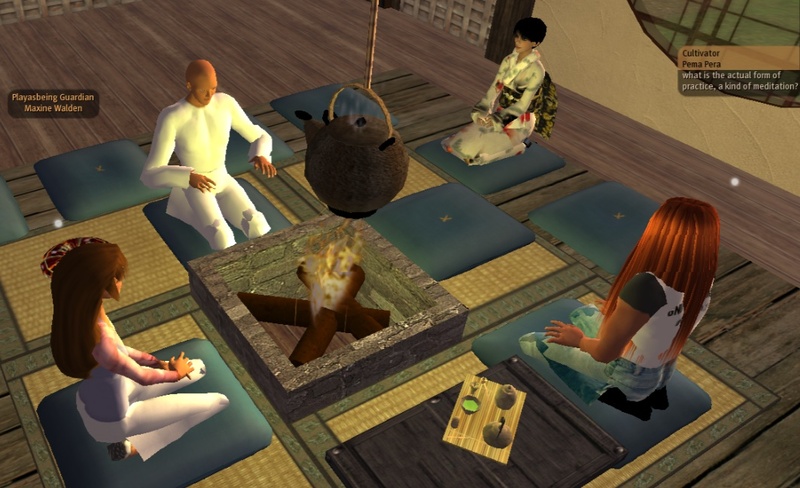 Pema Pera: it’s just that right now I have another meeting in another virtual world (Qwaq) . . . .
Pema Pera: Gam, I’m really looking forward to hearing how your vipassana jibes with the 9-second explorations! Pema Pera: sorry everybody, have to run now! Pema Pera: glad to hear that Adams! Pema Pera: Bye *, Max, Gam, Adams! Pema Pera: feel free to stay here, of course, as long as you like! Maxine Walden: and hope to see others very soon. Adams later kindly send me the chat log covering the rest of the meeting. The comments I added are mine. After Maxine and I had left, Adams, Gambhira and Stargate continued the conversation. Gambhira Skytower: are either of you buddhists? Stargate Tone: You know why ? Gambhira shared some background about Buddhist activities here in Rieul with Adams. Adams Rubble: I have met some zen monks, are there others? Stargate Tone: Do You know how You have found a piece of the Truth ? Stargate Tone: You many times feel suprise; oh; this easy this was…. Stargate Tone: You take him to be higher than You ? Stargate Tone: can I hear the quesiton You have in Your mind ? Adams Rubble: Is that bad? Adams Rubble: I am finding this interesting but I am not sure I completely understand…. Adams Rubble: is that what you mean? Adams Rubble: Gambhira, is that what you use meditation to do? Adams Rubble: Do either of you know how to copy the cimmunicate window? And she then asked to let go of her message. Adams Rubble: Do you mean friends? Stargate Tone: are included to human way of thinking…. Stargate Tone: we could’ve been talking as well about the weather…. Adams and Gambhira returned to Buddhism, after Stargate had left. Gambhira Skytower: is that what you feel? Gambhira Skytower: i see. what path are you following? The conversation turned to anger, a potentially very powerful form of fuel for explorations. Gambhira Skytower: a killing reflex u mean? Adams Rubble: yes, good, back to mindfulness…and that from meditation? Gambhira Skytower: you mean does mindfulness come from meditation? Adams Rubble: or can it? And the conversation circled back to PaB. Gambhira Skytower: how long have you been doing it? Or better still, see through the illusion of there being a self, or ego, in the first place. Perhaps what we call self/ego is just a way to look at the world, a type of mindset or filter, and nothing substantial that could even be suppressed or gotten rid of — just a tool that we can view for what it is and use it without being distracted by it. To be continued!